• Custom length chain available! Harrington's LB lever hoists combine easy operation with a compact, low headroom design that easily handles real-world demands. 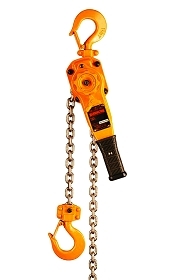 Rated the number 1 selling lever hoist in the U.S., these hoists can be used horizontally, vertically, inverted or at any other load angle and have the strength to get the job done.